Oh. My. Goodness. So Friday night was off the HOOK. Union Hall was jam packed with progressive metal, but most of my anticipation was held for one of my most favorite musicians - Devin Townsend. Kicking off the night, UK prog metal sensation Monuments was up first. I haven't heard Monuments before... But just a few songs into their set, I decided that this band was the perfect opener for this particular show. Their songs were all about the punchy melodies and wanky guitar riffs - making them exceptionally well suited for this tour. Plus, it was nice to reconnect with a new friend, who I met back in August for Edmonton's Harvesting Hell festival. Alex was previously drumming for technical death metallers The Faceless, but has moved on to Monuments, and is a great fit for the band, and I wish him all the best with his new bandmates! Devin Townsend was up next, and my excitement levels were over 9000 *lol, kudos if you get that reference ;)* I have been a HUGE fan of Devin's work for years now, and have always viewed him as a big inspiration while his music held such a strong impact on my life. Both, in Strapping Young Lad, and with the Devin Townsend Project - the man is a musical genius, if you ask me. Playing a handful of new songs off of his newest dual record entitled 'Z2' - featuring albums 'Sky Blue' & 'Dark Matters' - Devin Townsend had people going absolutely wild! I have never seen a musician get such a positive ovation from their audience. Between his awesome facial expressions, and telling jokes at the end of songs, Devin is one hell of a performer, and one of the most powerful singers I have ever seen - Being in a photo pit, right up at the front of the stage for the first 3 songs of a set, usually you cant hear much... Drums, bass... Maybe the odd guitar squeal... But Townsend's voice soared through the monitors with ease. It gave me chills up and down my spine, which is something that does not happen often, let me tell you that! Lastly, Devin closed off the set with 'Grace' and 'Kingdom' - two songs off of 2012's album 'Epicloud' - Two of my personal favorites of his, so of course I was singing at the top of my lungs, along with all of the other people who were relentlessly singing to these beautiful songs. Once their set was over, the members of the Devin Townsend Project began tossing guitar pics, drumstick and set lists into the audience, while Devin stepped down to the barricade, hugging, shaking hands and give high-fives to anyone he could reach. Like I mentioned, the ovation this man received here in Edmonton was staggering, and I truly cant wait until he's back in town to melt some more faces. 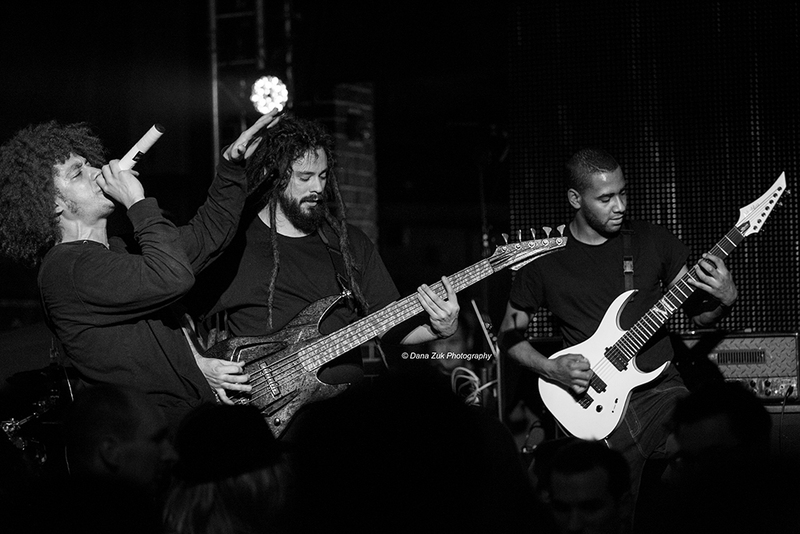 Hailing from Washington D.C, and Friday night's headliner, Animals As Leaders was up next. Even though Animals As Leaders was in Edmonton at the beginning of 2014, they still drew quite a big crowd to Union Hall. The technicality within the music that this band creates is completely mind-boggling - playing as a 3 piece instrumental band, these three musicians have to be some of the best in the business today. Though I do not closely follow their music, as a (kind of) musician myself, I completely appreciate the composition behind the music that AAL puts out there, it's mildly impressive *to put it lightly* and heavy as all hell at the same time. I wish to have at least a fraction of their musical talents some day! Regardless of my lack of knowledge behind Animals As Leaders' music, they put on one wicked show, leaving fans both old and new, in complete awe, and on the edge of their seats, eagerly wanting more. Overall, my analysis of Friday night's show... Probably one of the best of 2014. Definitely in the top 5, for me anyway! Want to see more photos from this show? Check them out here! 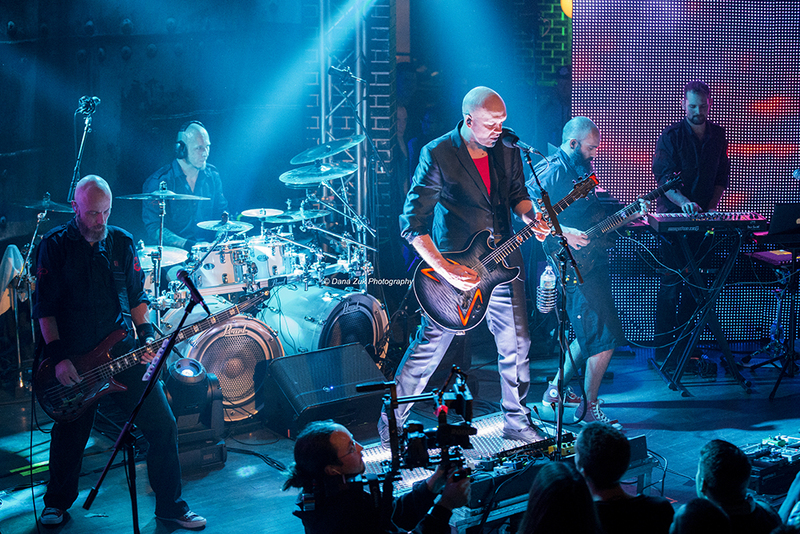 I also did a review of the Devin Townsend Project's set! Click here to check it out!